Hello friends! I hope today finds you safe, well and happy. So much happens in a week and I know with the crazy weather of late, many of you may be hunkering down for the Labor Day Weekend. Today is Day of Giving Friday and today I’m sharing one of my favorite sentiments – it was one that I included in one of my past kits and this new one was beautifully penned by Suzanne Cannon with Quietfire Design. What a lovely statement about the power that memory has to evoke something so very lovely . . . a flower, a song, the thought of a loved one. That’s within our power; queue up those lovely memories! The card base is 7″ x 7″ (custom envelope make with the Envelope Punch Board). Easily downsizes to 6″ x 6″. On top of my card base I added a panel 6-5/8″ x 6-5/8″ followed by a panel 6″ x 6″. Next I added my diecut panel with Spellbinders Intertwined Spirals, cut as an inlay, including the circle and trimmed it down to 5-3/4″ x 5-3/4″ On the lower part of the circle I added Amazing Paper Grace Filigree Corners die (retired) to fill in. I finished up with a triple bow, pearl button and a spray of mulberry roses. For new readers, every Friday it’s my pleasure to give away a card. The card goes to a randomly picked reader (worldwide) who leaves a comment in our conversation. Want to know more about Day of Giving, here’s a link to my FAQ’s just check out #11. You can check to see if your name is on the list of winners HERE. For your comment: Recalling sweet memories is lovely ability, what are your so called roses in December? Today is the most gorgeous day we’ve had in so very long!! What a miracle seeing as a hurricane came through here last night. It’s truly the beauty after the storm. Have a lovely holiday weekend friends and a lovely weekend to my friends abroad. See you soon!! I love the roses, they are my favorite flower, of course I don’t need the flower just the person that gave them to me. Up in Ohio visiting my sis and just discussing No Becca today. I told them probably because of the hurricane! Probably no power and then there you are. My parents and other loved ones that have passed are my roses. Praying for those who are facing difficult and dangerous conditions. Glad you survived the hurricane, and hope your recovery is going well! Love your card… simple, yet truly elegant. Just beautiful! What a beautiful reminder that there is beauty after the storm and that, for every painful memory, there is a rose in our garden. This comes to me at a perfect time. 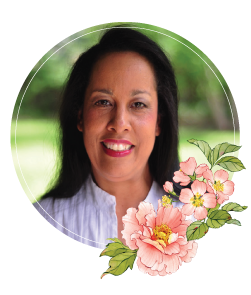 I am heading into the seasons of my life that are punctuated with many losses. Today, I received a gentle nudge to know that beauty is everywhere. What a blessing. Thank you for making my day, once again! A stunning card today, as usual, thank you. My December rose is my Husband whose birthday is 2 days after Christmas and we celebrate 50 years marriage in October. God has been so good in giving me a kind and caring man for all these years. Wonderful card and sentiment Becca – makes you stop and reflect! Since yesterday was our 32 Anniversary, I am still thinking about when we met – the how and where 32 years ago. It has been a wonderful journey, and now with hubby terminally ill the memories mean even more – my Roses in December! Thank you for the sweet thoughts! The intertwined spirals is such a lovely die, Becca! And your card is gorgeous. The last 3 years in my part of the UK, we have had very mild winters and I have had roses in December! I saw a couple pruning their rosebushes back hard this week and thought what a treat they might miss! Memories of those we have lost are my roses in December. So much to be grateful for. Hello there thank you for sharing a card from your dies !! which I have lol . Good morning Becca, Beautiful card. My rose in December is my husband who passed 17 years ago. He loved Christmas and I miss him so much. Hi Becca, glad to hear you are alright and no damage from the hurricane, I was thinking about you when they said it was heading for Panama City. 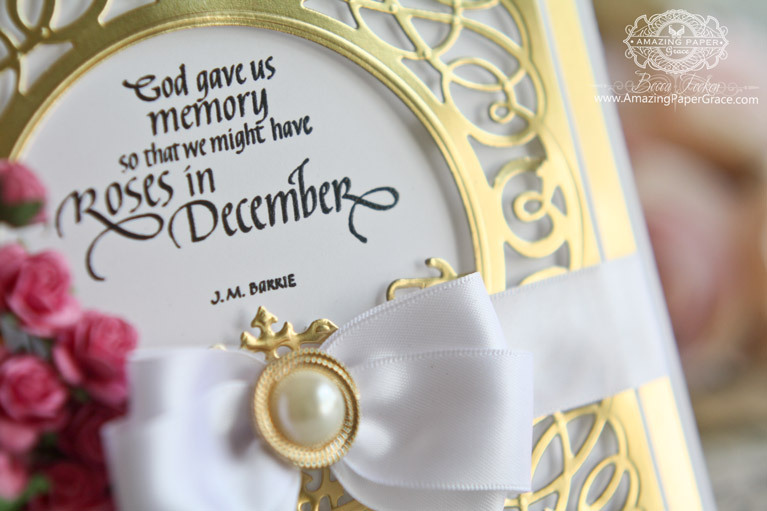 Love your beautiful card and the gold and white with just a little colour. Gorgeous card! 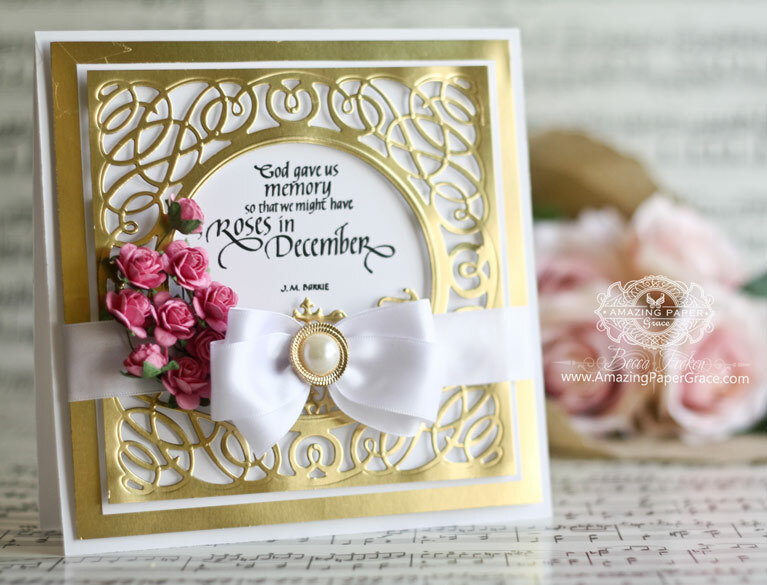 I love the gold paper and the beautiful roses! My niece is visiting from CA this week and we have been reliving so many memories. It’s been wonderful. Looking at old pictures and remembering good times over the past 40 years. So many roses – to many to count. Whenever my December comes, there will be plenty to scent the days! Lovely card, for a lovely sentiment. I do hope you are beginning to walk a little..Happy long weekend, and it is good to know you weathered the storm intact and well. Beautiful card, and love this die! I want this die–it just moved to the top of my wish list. My roses are my family that moved to heaven and for the memories my grandchildren are making with us. A beautiful and elegant card, Becca. Love the gold/white color combo! Loving your card and the verse is beautiful. My Dad and Mum Passed at very early ages, Dad 45, Mum 56 ,when i was clearing the house i came across 2 little santa Decorations for the tree ,they had gold sparkle coats on , however 48 years later the sparkle has gone but they still have pride of place at the front of the tree. My roses in December are memories of my sweet mama and my “other mom”, both who spoke love of others and love of Jesus into my life. I truly love using the gold foil paper with the dies that you put us on to at Hobby Lobby. Perfect every time. Love your card and thank you for the instructions and supplies each and every time. You are amazing. I hope you are getting around better each day and that someone helped you bring in your lawn furniture. Have a beautiful week! Oh dear I forgot to comment on this week’s memory. Sorry, I have not been on here for ages, longer than I thought lol! Your creations are amazing loved last weeks and this weeks is gorgeous to say the least. I really love how you photograph all of your cards too, makes them stand out, so beautiful. Glad you were not harmed in the hurricane but had a beautiful day after, we are so lucky in that respect over here.